I’ve never had any serious issues with taxis or taxi drivers, but that doesn’t mean it can’t happen. I’ve heard of taxis driving away with people’s luggage still in the trunk, taxi drivers overcharging you a fare because they didn’t turn on the meter, and I’ve read about tourists being taken to ATM machines and forced by their driver at gunpoint to withdraw all their money. Taxi cabs are supposed to be a safe bet when you’re in an unfamiliar city to get from place to place but sometimes you do need to exercise some caution about where you’re getting a taxi from and how reputable they are. So, to brush you up on some things to keep in mind when you’re hailing a cab, here are some tips about taking taxis at your destination. The easiest way to ensure that the taxi is safe and reputable is to get the front desk clerk in your hostel or hotel to call one for you. They know which companies are reliable and can reserve one in advance so you won’t have to wait for it. The Philippines were the worst for taxi drivers who refused to turn their meter on. In Manila, I asked over half a dozen drivers to turn their meter on before I found one who would. If the meter isn’t running, they can charge you whatever they like, which is going to be an incredible amount compared to the actual fare. The taxi ride I was taking in the Philippines was 70 pesos on the meter, roughly $2 CAD, but everyone else was asking 400 pesos, almost $8 CAD more. They see a tourist and they see money and opportunity. Insist they turn the meter on or get out if they don’t. Either they’ll change their mind and do as you ask, or you simply get another cab even if you have to wait. If you can, ask someone in advance what to expect to pay for a fare if there is no meter, or look it up in your guide book as it usually tells you rough prices. Often fares are more expensive at night time so be prepared to pay a little more if you’re going out after dark. All taxi’s belonging to a properly registered company should have and clearly display their credentials in an easy to spot place inside the cab. Check it out and make a note of it before you accept a ride with a taxi as there are many unofficial taxi’s, especially in poorer countries. Taxi’s right outside the airport are generally price standardized and official, but often charge more than the ones you can catch on the outskirts of the airport. You might have to do a little walking with your luggage but sometimes you can save over half the cost with a non-airport affiliated taxi. Just don’t forget to double check the taxi’s credentials before you get in. Just met a new friend on your airplane and discover you’re going to the same area in the city and they want to split a cab? At first thought that sounds great as cabs, especially at the airport, can be extremely expensive. But think cautiously about whether you do want to share a cab with that person or not. Chances are he or she will be just fine and you aren’t in any danger, but use your best judgement as you never know if it’s a local set-up to harm you or steal your stuff and leave you stranded. This one is tricky as you might not have any other option. That’s why it’s so important to make sure the taxi and it’s company are reputable. If you are traveling on your own and are concerned about the reputability of the taxis, ask around at your hotel, the airport information desk, or any place that will give you an honest answer. People working in these places can tell you which taxis to flag down and keep an eye out for and which ones to avoid. 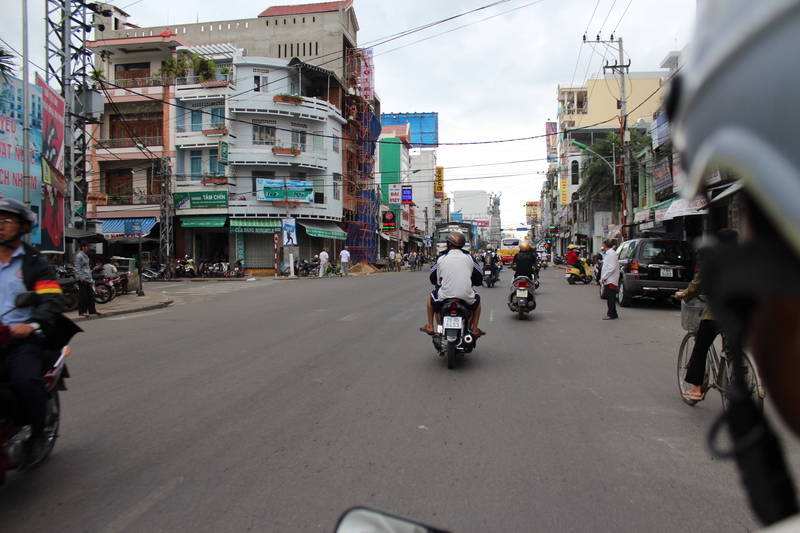 In Vietnam I often took a motorcycle taxi as it was the easiest way to get around. In Nha Trang I was explicitly clear with the driver and had an understanding that the entire length of the ride (I was going to multiple places and he said he would wait for me) was only 20,000 Dong, or $1 CAD. I made sure that it wasn’t each leg of the ride was $1 but the whole entire trip as I felt it was a little too cheap for the distance we were covering. He insisted it was only 20,000 and tried to rush me onto his bike to get going. When we made it back to my hotel and I handed him the bank note he looked angry and said it wasn’t enough. He said I owed him 200,000 Dong not 20,000. Since I had been so explicitly clear before I ever got on the bike, I insisted he was wrong and absolutely refused to pay him anymore. He was quite enraged and ended up leaving in a huff. Moral of the story: make sure both you and your driver clearly understand what the agreed upon fare is, especially if there is a language or accent barrier. Often when you get quoted a price, depending on the country you’re in, it will be per-person. No matter what, double check with the driver if it’s the total price or per each person in the taxi with you. It’s no fun paying double what you expected. This is a tough one as a new city means you don’t know where you’re going (which is why you’re probably in a taxi rather than trying to decipher the complicated bus system). But take a look at a map in your guide book or Google it online before you arrive to see roughly how far it is from your start point to where you want to go. Taxi’s will sometimes take the long way around to make more money, so if you know it’s only supposed to be a 2 minute ride, call them on it so you’re not stuck paying for more than you expected. It’s never happened to me personally, but I’ve heard of people losing their luggage because the driver drove off with it as soon as the person got out of the car. Wait until you have your luggage before you pay them or have your travel companion get the luggage out of the trunk while you wait in the taxi. You can also insist the driver get out of the taxi with you (often they’ll open your door so they do this automatically) or ride with all your luggage in the cab of the vehicle if there is space. Yeah! Great Post! The important things which you have mentioned is very essential for all the people to know. I have stucked on choosing right taxi for my first trip. But now it is clear how to make a trip as easier and safe. Thank you. Great Post! Thanks for sharing such healthy and safety tips for taking taxis. My pleasure Shahul! You can never be certain with taxi’s these days unless you know for sure they are official! Ashlyn, thanks for pointing out that it is important to check your taxi serivce’s credentials. I didn’t realize that there are so many unregistered taxis. It seems like it is vital that you are traveling with a licensed, reputable driver to make sure you get around safely, especially when you are travelling alone. My pleasure Marie! Every country I travel to seems to have a different way of registering and dealing with taxi’s so it’s always something I’m aware of when traveling. Even at airports there can be unreputable taxi drivers trying to take you to your hotel. It’s not always easy to know!